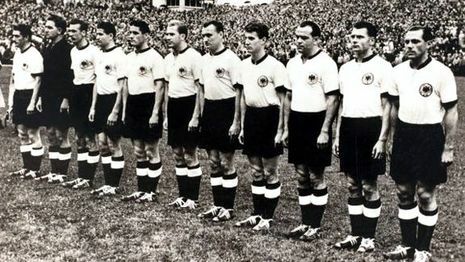 West Germany Defeats Hungary to Win 1954 FIFA World Cup in "The Miracle of Bern"
The 1954 FIFA World Cup, the fifth staging of the World Cup, was held in Switzerland from 16 June to 4 July. As the year saw the 50th anniversary of FIFA, it was appropriate for football's premier competition to be played in the home of its governing body, and Switzerland was chosen as hosts in July 1946. 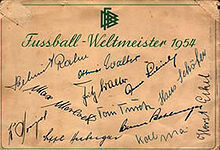 The tournament was won by West Germany, who defeated Hungary 3–2 in the final, giving them their first title. The anniversary tournament in 1954 was to take place in Switzerland to celebrate the 50th anniversary of FIFA, which had headquarters in Zurich since 1932. 36 national teams took part in the World Cup qualifiers and 16 made the finals. Sweden and Spain, 1950's finalists surprisingly didn't make it this time. 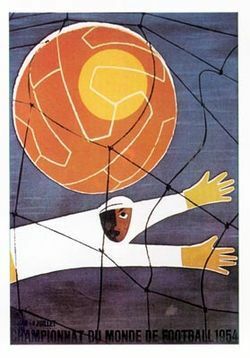 Argentina, the World Cup boycotter didn't show up again, and neither did the strong USSR team. First time participants were teams from Korea Republic, Scotland and Turkey (the last two teams chose not to participate in the previous competition).